The best protein shaker bottles were originally designed for mixing protein shakes. However, I learned with my very first shaker cup just how convenient and versatile they are for mixing all sorts of things, even in the kitchen. If you’ve ever mixed anything that started off as a powder form in a glass, you will love using shaker bottles. Most shaker bottles come equipped with a stainless steel wire whisk ball, but some are battery operated with blades for cutting and mixing dry ingredients. They’re all great for smoothies of any kind, mixing pancake batters, omelets, highballs, and about anything you care to mix, healthy or not. But to tell you the truth, Protein shaker bottles have come a long way since their inception and continue to evolve as more and more people learn of their convenience and ease of use. Today many brands have built-in compartments for carrying anything from extra protein powder to supplement pills. Really, you can put your keys, money, notes, rocks, whatever you care to put in the added bottle compartments. So, now you have an idea what a shaker bottle is and how handy they are for most anyone, including gym or exercise enthusiast and people who really enjoy them in the kitchen. Let’s take a look at a few protein shaker bottle reviews. 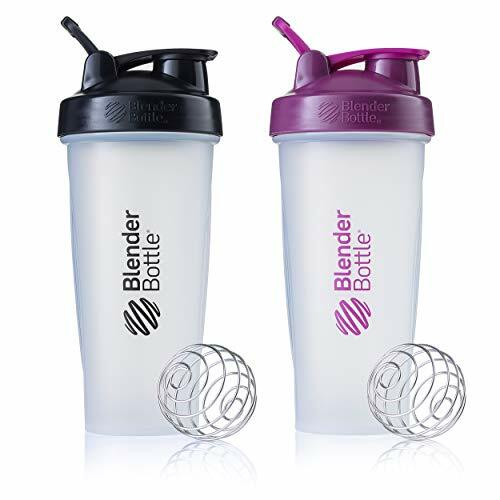 The BlenderBottle Classic Loop Top Shaker Bottles are known worldwide because they are a great starter bottle with a greater price, and quite simply — they do a great job. I think anybody looking for a simple shaker cup that does everything it needs to do, and is very easy to clean will enjoy this bottle. It does a great job, and is quite economical. These shaker cups always come with the famous blender metal ball to get the best creamy texture from your drinks. So whether you are a pro athlete, or want to mix pancake mix for breakfast, this shaker will do the same job as the high-end cups. To be honest with you, it’s so inexpensive you can pick up a package of 2 or 3 for what you might spend on a more expensive shaker cup. Having several Shaker Bottles around lets you mix several shakes or smoothies in the same day in different bottles. *That can keep you from worrying with washing your cup after each use throughout a day when you’re drinking several shakes a day, right? The BlenderBottle is perfect for you to mix any of your supplements and priced for anyone to afford. If you have a family you will love all the different colors and sizes to fit the needs of each family member and keep them separate. Umoro One Multifunctional Shaker Bottle truly multifunctional and is one of most diverse shaker cups on the market. It’s different than most shaker cups that use a screw on compartment for protein powder in that Umoro utilizes a simple one button system. Since this is design for protein shaker cups is different than most, it makes a great gift item for someone you know who could use a great protein shaker cup. 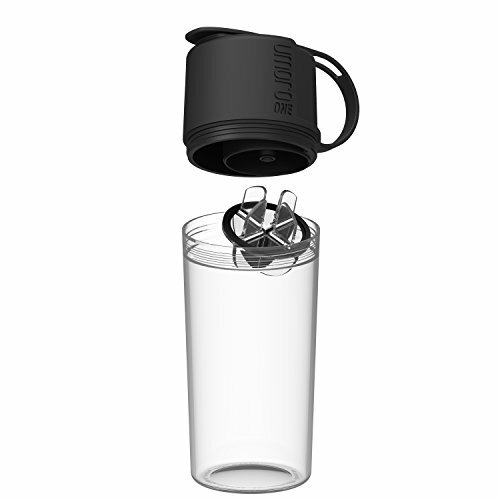 Umoro has a very simple and sleek, clear design, along with measurements on the side to let you know the amount of liquids that are in it. (I had to choose between the image with the measurement line and showing you the unique shaker ball. Click the image and see the measurement line) The Umoro One shaker bottle also has 9 vibrant colors to choose from. Personally I like colored bottles merely because they’re easier to spot when I’m looking for it? This shaker cup eliminates the need to carry a water bottle around as well. You’re able to keep refilling it with water as needed, and then just push a simple button when it’s time to work out and access your protein powder. The Umoro One Protein Shaker Bottle is a very cool and unique design for a shaker cup, and besides just catching everyone’s eye when you use it, you’ll find that it’s much more functional than its competitors. The Promixx 2.0 is the shaker bottle that takes protein shakers to the next level. And the thing about Promixx is that they just keep getting better year after year with more improvements. This is a state of the art portable rechargeable electric protein shaker. No hand shaking — the battery-powered engine does the job for you. Perfectly mixed protein powders, every kind of powdered supplements, milkshakes, baby formulas, eggs, pancake batters, juices, cocktails, coffee and tea drinks, etc. 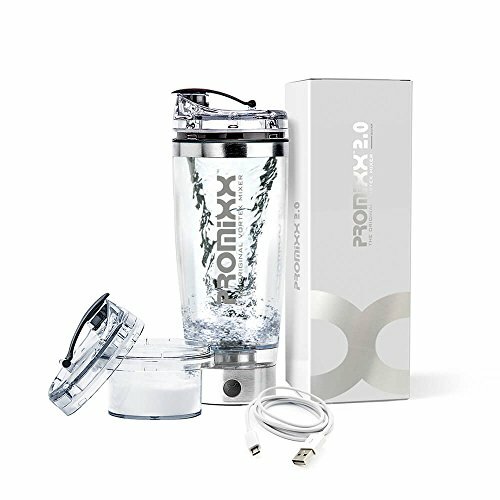 If it needs mixing, Promixx has you covered with the push of a button. Watch the liquid form a vortex tornado as it spins its way to smooth and perfect drinks in mere seconds with no shaking and no shaker balls to contend with. It’s integrated Lithium battery is completely rechargeable and comes with a USB cable included. The motor is fully detachable so you’ll have no problem cleaning the shaker bottle. No more leaks either. Not with this 100% leak proof guarantee that comes with the one year warranty. Don’t worry about carrying your mixes in a separate bag or container with the onboard storage space on top that comes with the BPA free container. And cleaning couldn’t be easier either. Just put a drop of detergent in and start the powerful vortex motor to watch it clean itself effortlessly. The Promixx 2 Vortex Mixer is hands down the most efficient, easy to use, and easy to clean protein mixer cup on the market today. They’ve never let it stand still when it comes to listening to ways to improve it, and it has long been a favorite of athletes around the globe. This SportMixer Tritan Grip Shaker Bottle is one of my favorites and one of the best protein shakers on this list. (The SportMixer comes in many colors other than the black in the image) Featuring the BlenderBall surgical grade stainless steel wire whisk and made from stain and odor resistant material makes it a favorite everywhere. This shaker makes a great water bottle, or any other beverage you have in mind. I love the hinged stay open flip cap that makes it easier to drink my protein shakes and beverages from. And I never need worry about it leaking in my gym bag or wherever I happen to stash it. The distinctive snap down cap makes leap proof in any situation. The SportMixer is made from medical grade plastic to keep it from staining and retaining odors from days gone by, which is a great asset for me. It’s easy for me to clean, and I love that about this shaker bottle. 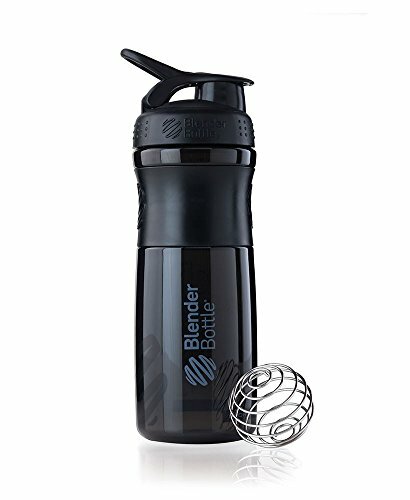 I wasn’t sure if I would like this bottle as much as I did the rather plain original BlenderBottles I’ve always thrown in my favorite gym bag, but as it turns out this is is one of my favorite shaker bottles. I really enjoy the sleek design and the made on grip to keep it firmly in my hand at all times. I like the ounce measurements on the side, but beware that it can be difficult to see the marks on the black bottle. And that’s my only complaint about the black SportMixer Shaker Bottle. How about this Hydra Cup Dual Shaker Cup? This cup can really come in handy to pre mix both your pre workout and post workout recovery supplements. Carry two drinks at one time, take your favorite protein supplement in one side and water in the other side. This Hydra Cup is quite the versatile protein shaker cup. This shaker is 100% made and assembled in America and is top quality. Two different color lids so there’s no problem with which drink is in which side. Use one side to keep your keys, money, cards, snacks, etc., and drink from the other side because they are two completely different compartments. I also love the fact that you can remove one of the flip caps and use it for a protein scooper when I lose touch with the original. 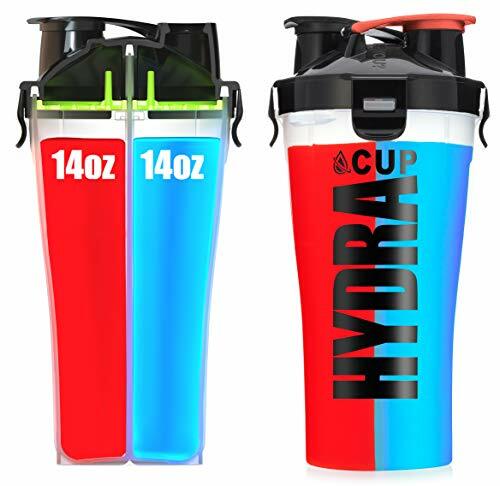 Hydra cup was originally created for the purpose of taking pre and post workout drinks in the same shaker bottle, but it didn’t take people long to realize how useful that second side is for taking a variety of things along for the ride. Between the two sides, it’s a pretty large capacity cup with a total 28 ounces. Don’t expect to see a wire mesh mixer ball with this protein shaker. Instead it has a plastic mesh screen in the top portion of the cup that you shake the mixture through. The Hydra Cup is quite durable, easy to take apart to get into, has two separte containers built into one cup, and has measurement marks on it.